Realtime semantic startup Evri is debuting its brand-new iPad application today, where it joins the crowded “iPad news magazine” space filled with the likes of Flipboard, The Daily, Zite, Pulse, NewsMix, AOL Editions, News360 and others. To differentiate itself from the pack, Evri’s app employs a combination of social news and topical streams, allowing readers to follow their interests as opposed to just following sources. 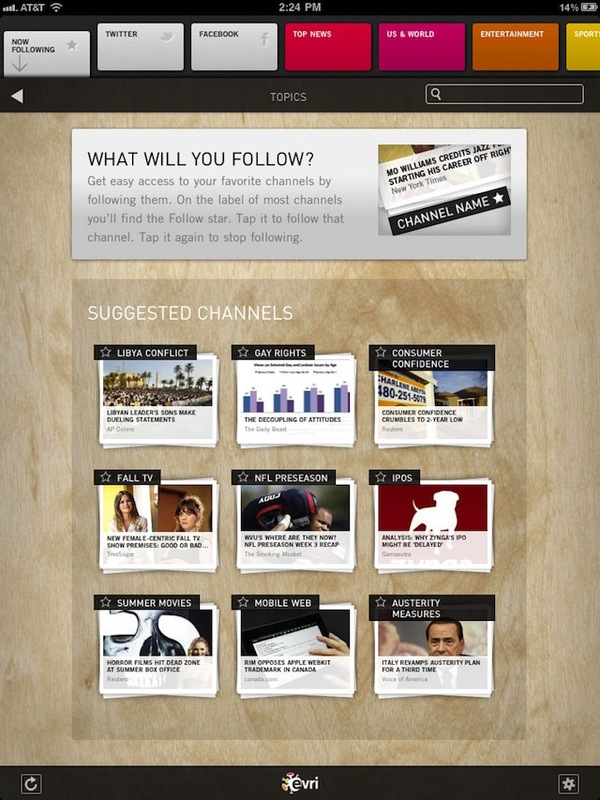 The new app relies heavily on Evri’s semantic underpinnings to turn unstructured data into topic-based channels. The company’s content discovery engine analyzes feeds from 15,000 news sources, runs the data through its natural language processing (NLP) parser and extracts entities which are put into Evri’s semantic index. In addition, the engine also determines what news is trending based on things like how many times a topic was covered, the velocity of coverage, how often its being shared on Twitter or Facebook and more. And unlike apps like News Corp.’s The Daily, Evri’s index is updated every 15 minutes, not…well, you know, daily. As it turns out, the Evri iPad app is a big improvement in the looks department. The user interface takes a little inspiration from Pulse, as it also features image thumbnails overlaid by white-on-black text. However, Evri offers its own unique take on topic navigation. 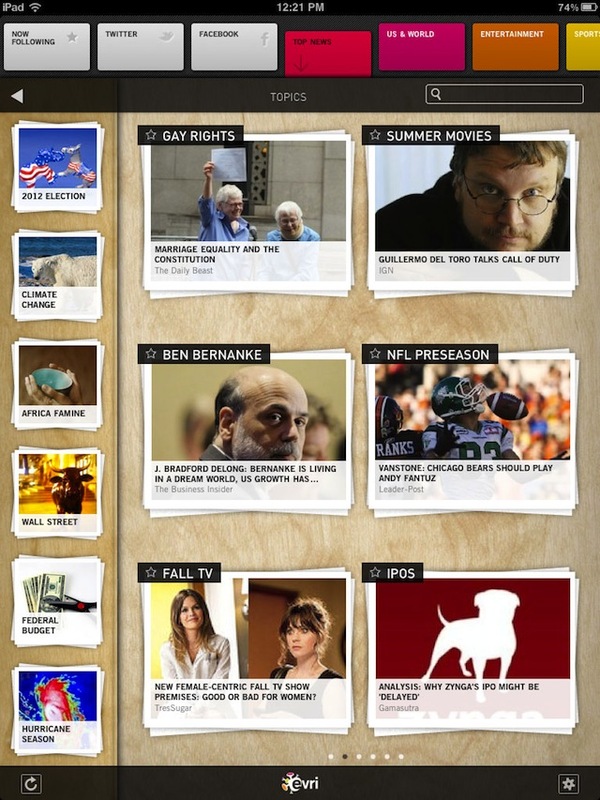 At the top of the screen are brightly colored squares for the major categories, including Top News, U.S. & World, Entertainment, Sports, Business and Technology. These are preceded by three grey buttons for social news (Twitter and Facebook) and “Now Following,” the section dedicated your personalized list of favorite topics. Tap on any of these major categories to see the trending news within those areas or delve into subcategories using the navigation on the side (also image thumbnails, but smaller.) That may sound like a lot of navigational options, but it’s well done, not overpowering and it disappears when you need it to. As you dig into the various sections, however, you’ll find only articles snippets, not the stripped down, clean text that apps like Flipboard provide. Evri is determined to be more “publisher friendly,” sending its users over to the actual website using an in-app browser, complete with sharing buttons and a “read later” option that supports both Instapaper and Read It Later. For readers, unfortunately, that’s not as pleasant an experience as the iPad-optimized Flipboard, which is, frankly, still the app to beat in this space. In testing, Evri’s app had the occasional slowdown and crashed a couple of times, but the version I used was still in development. Hopefully by today’s launch, those bugs have been squashed. 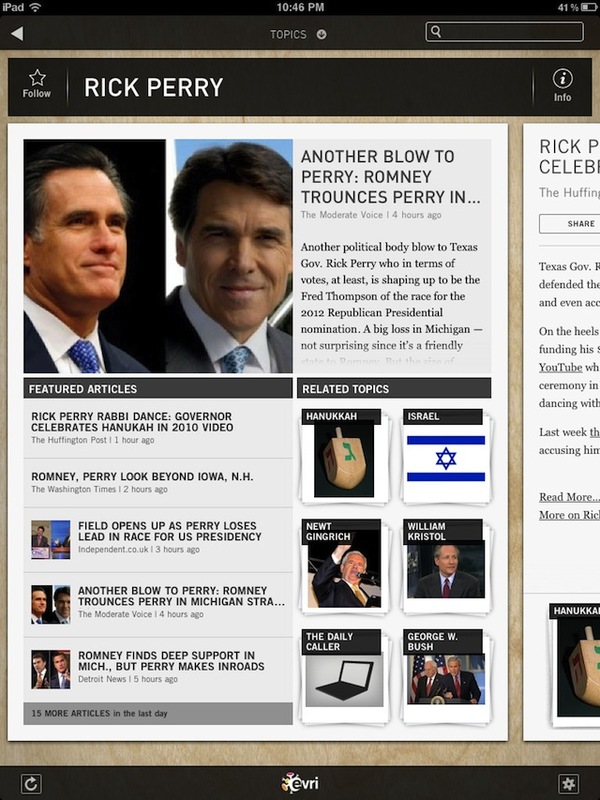 When the app was functioning, it was easy to swipe through pages, star favorite topics, share, save and read articles.